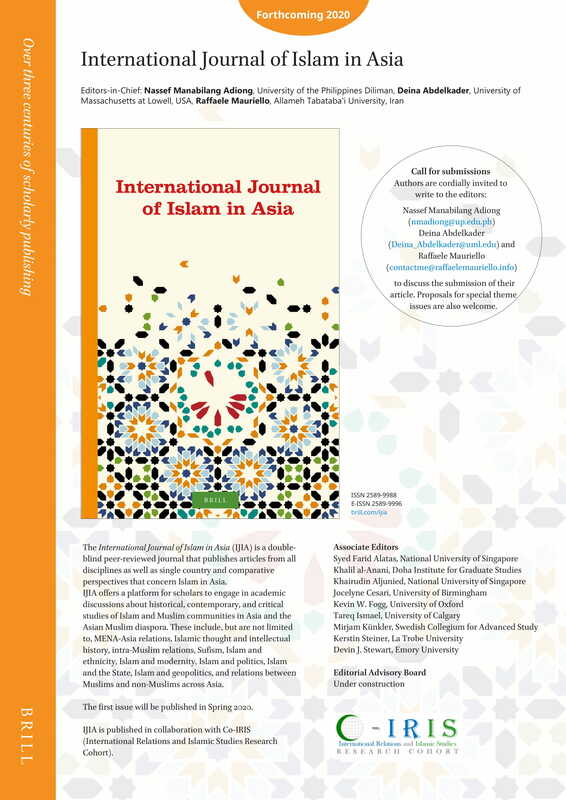 The International Journal of Islam in Asia (IJIA) is a double-blind peer-reviewed journal that publishes articles from all disciplines as well as single country and comparative perspectives that concern Islam in Asia. IJIA offers a platform for scholars to engage in academic discussions about historical, contemporary, and critical studies of Islam and Muslim communities in Asia and the Asian Muslim diaspora. These include, but are not limited to, MENA-Asia relations, Islamic thought and intellectual history, intra-Muslim relations, Sufism, Islam and ethnicity, Islam and modernity, Islam and politics, Islam and the State, Islam and geopolitics, and relations between Muslims and non-Muslims across Asia. Authors are cordially invited to write to the editors, Nassef Manabilang Adiong (nmadiong@up.edu.ph), Deina Abdelkader (Deina_Abdelkader@uml.edu) and Raffaele Mauriello (raffaele.mauriello@mac.com), to discuss the submission of their article. Proposals for special theme issues are also welcome.